Optimal thyroid hormone production is one of the most important factors to whole body health. In response to TSH signals from the pituitary gland, the thyroid gland produces the vital T4 and T3 hormones that set the basic metabolic rate for every cell in the body. This includes brain, heart, lung, bone, muscles, your immune system, digestion, liver and kidney function and everything else. Sub-optimal thyroid function can cause a wide range of chronic or debilitating symptoms including: fatigue, depression, weight gain, brain fog, cold intolerance, hair loss, constipation, low bone density, and poor immune function. With a system this important, you might think that conventional medicine would be completely up to date on how to keep track of this vital hormone. However, if you thought that conventional medicine had this well in hand, you’d be completely wrong. Most conventional doctors will check TSH to assess thyroid function. 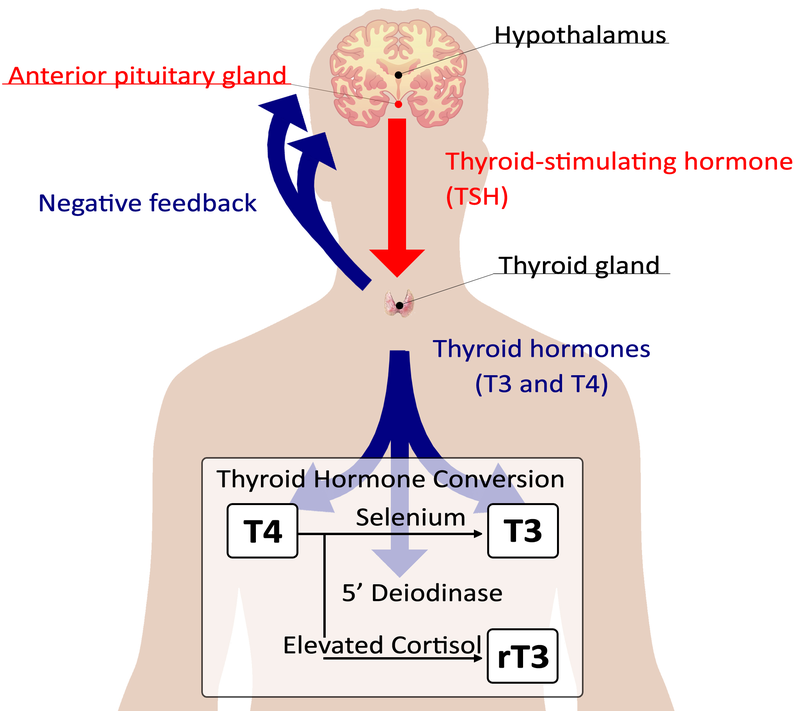 A high TSH generally indicates that the pituitary gland is “yelling” at the thyroid to get to work making T4 and T3. Testing TSH not a bad start, but conventional doctors run into a HUGE problem right away with the so called “normal range” for TSH. For starters, the normal range in use by conventional doctors around the world is anything below ~4.5-5.0 mIU/L. Tragically, this number is a full 15 years out of date with not only the research but nearly all of the major bodies governing official recommendations for how to practice medicine and interpret lab tests. Below are three very well supported recommendations that somehow, conventional labs and doctors have been ignoring for 15 years. Strike one! 2002 – American Association of Clinical Endocrinologists narrowed the serum TSH reference range to 0.3-3.0 mIU/L, lowering the upper reference end to 3.0. 2003– The National Academy of Clinical Biochemistry, Recommends a TSH upper limit of 2.5 mIU/L. 2003 – the consensus panel (Endocrine Society, American Association of Clinical Endocrinologists, and American Thyroid Association) recommended a target TSH range of 1.0 to 1.5 mIU/L in patients already receiving supplemental thyroid therapy. The result of this drastic and institutionalized misinterpretation of TSH is that millions of people that have low thyroid symptoms (fatigue, depression, weight gain, brain fog, cold intolerance, hair loss, constipation, low bone density, and poor immune function) are told “your thyroid is totally fine” by conventional docs. The tragedy is that supporting thyroid function is easy and relatively harmless and instead of getting the help they need, patients get told nothing is wrong with them or put on antidepressants they dont need. Thankfully well-trained naturopathic doctors (NDs) and IFM Certified Practitioners (IFMCP) are trained in an updated method called USING THE AVAILABLE RESEARCH AND RECOMMENDATIONS. If someone is symptomatic and has a TSH of >2.5, then thyroid support should be considered. If someone is on thyroid support, and is still symptomatic, then it might be worth adding more thyroid support to get their TSH below 1.5 or 1.0. Pretty simple really. Unfortunately, there’s more trouble with the conventional approach. When someone does manage to cross the outrageously high TSH bar to get a diagnosis of hypo-thyroidism, the treatment they get often doesn’t work. The conventional therapy is Synthroid, which is pure T4. 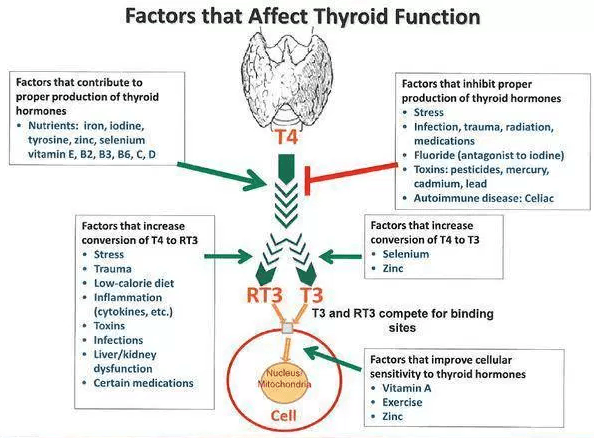 Remember that the thyroid gland produces both T4 and T3. T4 is ~5x more abundant and has a long half life of 5-7 days but is so weak that it has very little activity. On the other hand T3 is ~4x stronger and has a half life of 6-24 hours. 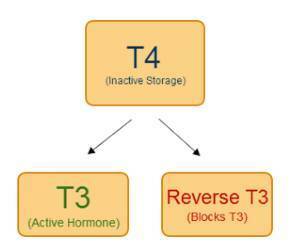 In order to keep your body running, you need to get T3 from your thyroid gland AND the T4 needs to be peripherally converted into T3. Some people do not convert T4 into T3 efficiently, and so the weaker T4 sits around not doing much. In the meantime, your TSH goes down to “normal levels” and the conventional doc tells symptomatic patients that the problem is not in the thyroid. Strike two! The alternative approach is to give T3 (cytomel) and T4 or desiccated thyroid like naturethroid or Armour thyroid that naturally contains the right ratio of both T3 and T4. Some people that have poor T4–> T3 conversion might just need more selenium and zinc–for which deficiencies are quite common. Sadly, there is a third major problem with the conventional approach to thyroid. Conventional doctors almost never consider a critical thyroid metabolite called reverse T3 (RT3). RT3 is much like it sounds, it is a version of T3 that fits the hormonal lock, but doesn’t send the strong T3 signal the body needs. It turns out that having low levels of RT3 is almost as important as having enough T3. The conventional range for RT3 is below 25ng/dL. In my practice, I think anything in the high teens is suspicious. 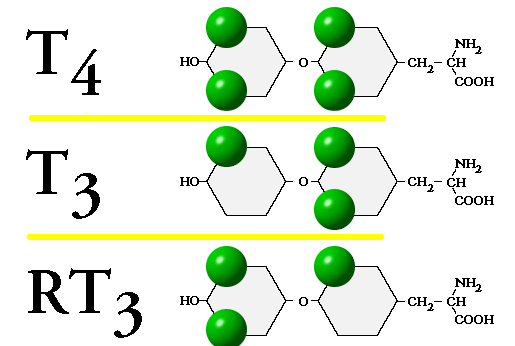 The best way to assess the effect that RT3 may be having is to measure Total T3 (TT3) and compare that to RT3. The optimal TT3:RT3 ratio is >6. Here’s the big take home. You can have a totally normal TSH, FT4, TT4, FT3, TT3, Anti-TPO, Anti-TG, etc. and if your TT3:RT3 ratio is high then, very, very few doctors will be able to recognize that you are in fact functinoally hypothyroid. Why does the body make RT3? In most people, RT3 is a normal byproduct of T4 metabolism. However in people that are chronically stressed (by starvation, pain, infection, inflammation, poor sleep) the body starts making extra RT3 in response to high cortisol as a way to slow you down, force you to lay low, and conserve energy until the source of the stress has passed. Here’s the catch: This using RT3 as “the brakes” system evolved millions of years ago when the stressors were often temporary while many of today’s stressors don’t go away. In any event, conventional medicine gets a big strike three for not looking at RT3 or the TT3:RT3 ratio. The take-home message is that if you are having low thyroid symptoms like fatigue, depression, weight gain, brain fog, cold intolerance, hair loss, constipation, low bone density, and poor immune function, then get into see a well-trained ND or IFMCP graduate and get the help you need. Don’t bother trying to convince your conventional doc about this, you’ll most likely be barking up the wrong tree. They’ll get it eventually, but they’ve already had 15 years to get the message from their own most trusted resources and somehow missed the boat. Dr. T.R. Morris is a licensed naturopathic medical doctor (ND). 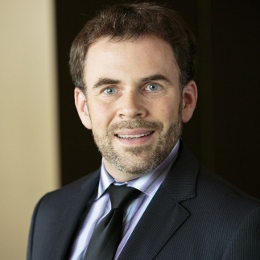 He is currently serving as consultant to the Institute for Functional Medicine (IFM). The IFM mission is to revolutionize medicine by teaching the latest genetic, nutritional, hormonal and other biochemically-based integrative medicine techniques to MDs and other practitioners looking for new tools to prevent and treat chronic disease. In the past, T.R. served as the medical director of a large integrative clinic and taught (genetics, physiology, biochemistry, microbiology, cellular & molecular biology) for 10 years for various medical programs in the Puget Sound. He sees patients in person (or long-distance via virtual consultations) from his home office in Seattle.